America’s Greatest Lay Preacher Fills and Thrill the First Baptist Church. 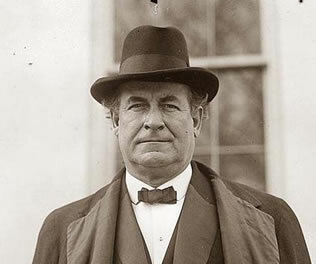 William Jennings Bryan, “The Great Commoner,” had come unannounced to Toccoa to pay a promised visit to Rev. Richard Forrest of Toccoa Falls Institute. Rev. Forrest was absent by Rev. Overman, Principal of Toccoa Falls Institute, welcomed the distinguished visitor. Rev. Overman rose to the occasion. He knew that Toccoa is proud of Toccoa Falls and that The Falls is proud of that fact. He resolved to give all of Toccoa the opportunity to hear Mr. Bryan. All local pastors were notified, and the First Baptist was accepted for the noted layman. The Invocation, by Rev. John Ellis, of the First Methodist Church, was a comprehensive reflection of the matters now uppermost in the public mind. Now, “Nothing extenuate nor ought set down in malice,” but when Mr. Bryan arose the audience cheered to a man—also to a woman. The subject was, “False Gods.” Those named as the most dangerous were the following nine: (1) Gold, (2) Social Prominence, (3) Fame, (4) Ease, (5) Intellect, (6) Wanderlust, (7) Gambling, (8) Passion, (9) Drink). The word “Conversion” has proved a stumbling block in the path of many who honestly seek fitness for Christian Membership. Mr. Bryan defines “Conversion” as “Surrender” followed by “Obedience” to the Commandments. Though long engaged in “big politics,” Mr. Bryan’s lay sermon shows that he has not been “absorbed” by that line of study, but has familiarized himself with the teachings of HOLY WRIT and has seen their applicability to everyday life. After the service Mr. Bryan returned to Toccoa Falls. Monday morning he addressed the students at the Institute.